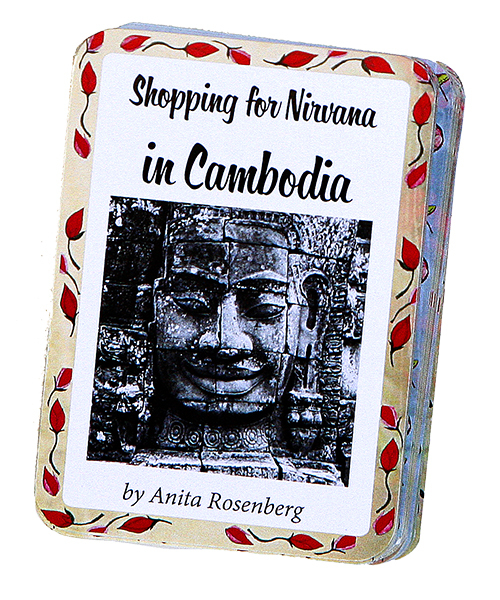 Inside this deck find 52 SHOPPING FOR NIRVANA IN CAMBODIA spirited adventures. Nirvana is about the objects you collect, the people you meet and the experiences you have. Cambodia was on "my list" but I didn't know anything about it. Friends living in Asia said I should go before it got touristy, so in 2001 I took the empty early morning commuter flight from Bangkok to Cambodia to see for myself the world-class ruins of Angkor before the secret got out. Cambodia was the first place I had ever visited where I knew no one at all to stay with, so I booked a room in the historic five star Grand Hotel d'Angkor where the service was so impeccable my feet barely touched the ground. Iorganized day trips to templ relics, to get in touch with a deeper sense of spirituality and the joy of solitude. These cards reflect my journey. I encourage you to visit Angkor to create yours. to villages of naked laughing children. We will visit lost empires that climb to the stars. 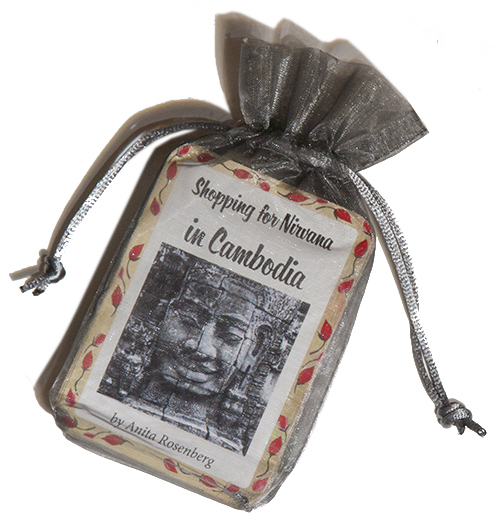 have a super trip in Cambodia." The idea for my travel card deck came to me in 2000 on my first trip to Hong Kong. At the posh store Shanghai Tang the only items I could afford at the time were the green tea room spray and a colorful deck of cards depicting sights in the city. I thought it was so clever and much easier than carrying a heavy book. 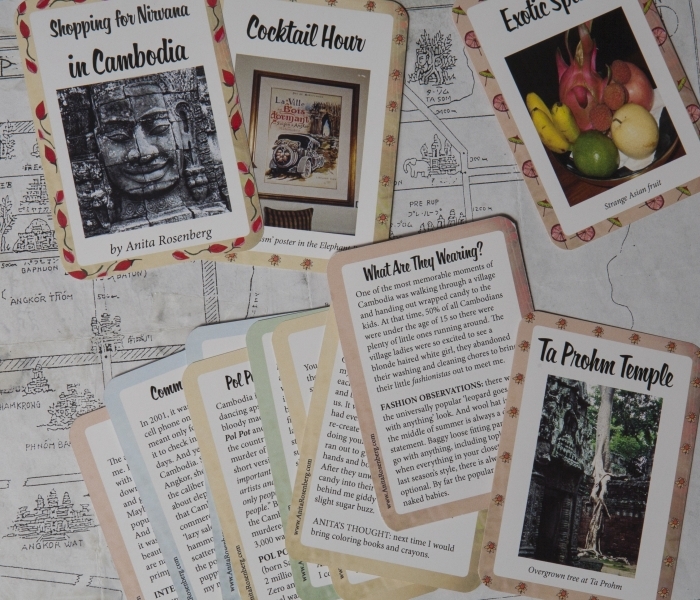 It was then and there I dreamed of one day designing my own deck of travel cards with my photographs and travel insights. 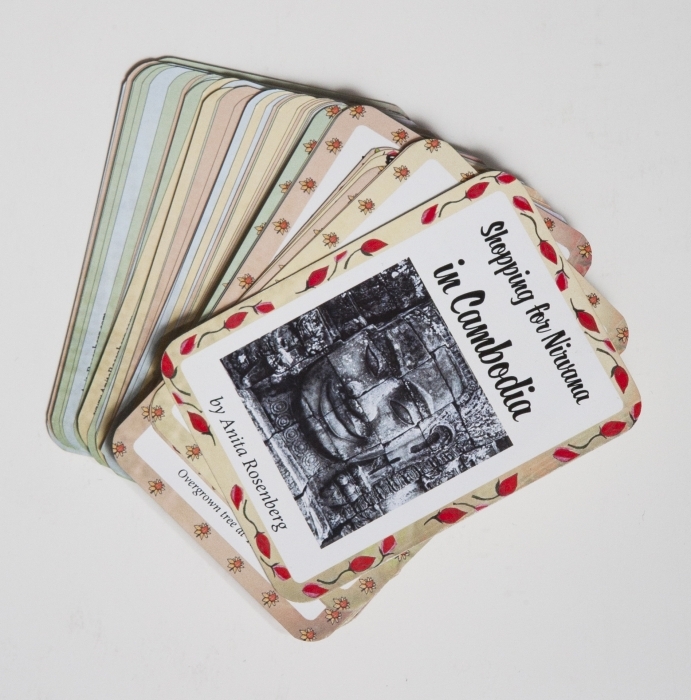 Many years later Shopping for Nirvana was born so I invite you to share in my passion for culture, spirituality, meeting new people, and having new experiences with my card decks.